← South Lakefront Corridor Transit Study — Shame! Detectable warning tiles, the tactile warning bumps at curb ramps, have been ADA mandated in new sidewalk construction since 2001. As per guidance from the Federal Highway Administration, detectable warning fields require good drainage and frequent sweeping in order to prevent the accumulation of water and debris. In Chicago, good drainage is famously difficult and the tiles rapidly deteriorate. Frost heave breaks fasteners and lifts many tiles out the sidewalk, causing tripping hazards, splashing, and an obstacle for those with reduced mobility. While tactile bumps can be formed directly into the concrete, thus eliminating cracks and frost heave, concrete bumps wear rapidly and are not replaceable. Unreinforced concrete truncated domes lose its shape and colour and ADA compliance very quickly, especially in locations where vehicles occasionally run onto the curb or snow clearing equipment is used. In Chicago, reinforced concrete detectable tiles have been used, and have deteriorated quickly. In wet locations, the porous concrete absorbs water that breaks the tile during freeze-thaw cycles. The broken concrete and exposed metal reinforcing mesh can pose a trip and cut hazard. A failed concrete tile with exposed reinforcing metal at 57th and Blackstone. CDOT has upgraded it’s durability requirements for detectable warning tiles and revised its list of approved products in 2012. Last year, the city posted a request for quotes for new and replacement tiles. All new installations will use more durable cast iron tiles while approved fiberglass reinforced polymeric concrete tiles will be used to replace broken tiles at existing installations. While breakage and deterioration of the cast iron tiles should not be a problem, there is no remedy for the drainage and heaving problems encountered throughout the city. An improved inspection regime could detect broken bolts before trip hazards form, but spring breakup will continue to breakup tiles. 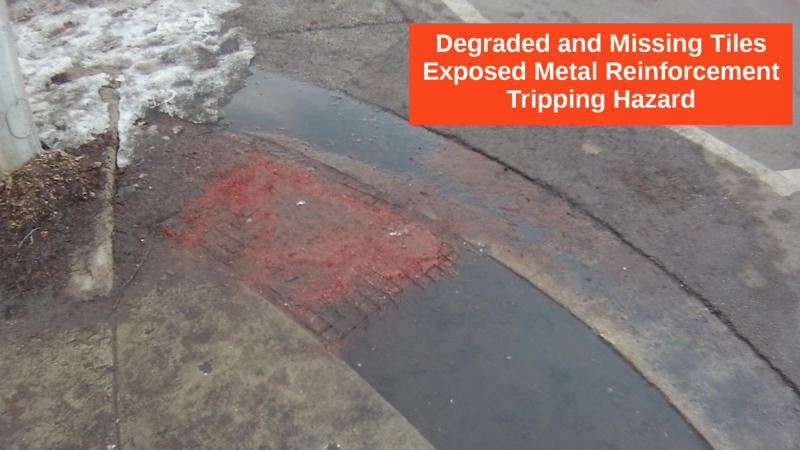 Call 311 to report broken and displaced detectable warning tiles in your neighbourhood. I am a graduate student in Physics at the University of Chicago. The whole handicapped tiles and curb cuts need to be installed correctly. At 5100 N Ridgeway, in Eugene Field park, the ramp for the path has been installed correctly on the west side of the street. However, on the east side there is a big “bump” and improper curb installation that prevents it’s use by wheelchairs. This was installed incorrectly, reported, but has never been corrected. That’s sounds like ADA non-compliance, and CDOT should have gone after the contractor that installed it for failing to meet spec (no lip larger than 1/4″, no gap larger than 1/2″). I believe CDOT generally contracts out most street reconstruction while in-house staff handle repairs, although this crosswalk may be different. South Lakefront Corridor Transit Study — Shame!